This DVD collection includes three 1-hour sessions as if you were with Kerry in person, along with additional supplemental sessions. Just follow the directions - watch each session alone, undisturbed and 5-7 days apart - you can complete the program and live smoke-free* in as little as 10-14 days! Start your lung detox today. 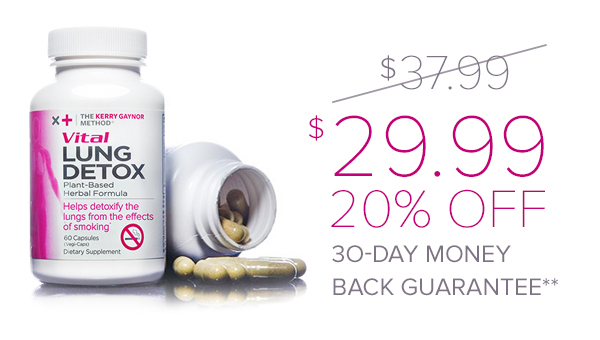 Using a powerful plant-based, herbal formula, Vital Lung Detox can help cleanse the lungs of daily pollutants and toxins such as cigarette smoke, chemical cleansing products, and traffic smog*. Accessible from any computer or mobile device, at anytime. This program includes three 1-hour sessions as if you were with Kerry in person. Each stream has a unique set of instructions, so be sure to read them before pressing play. Just follow the directions - watch each session alone, undisturbed and 5-7 days apart - you can complete the program and live smoke-free* in as little as 10-14 days! Includes one year access!